FIFA 17 is out NOW. If you’ve already played it, good for you. If not, you probably either don’t care or are desperate to get those thumbs working. The one consistent improvement in FIFA games down the years has been the graphics. And once again, they’ve raised the bar, as the majority of these Arsenal player faces illustrate. Aaron Ramsey, Alex Iwobi, Alex Oxlade-Chamberlain, Alexis Sanchez, Danny Welbeck, David Ospina, Gabriel Paulista, Gedion Zelalem, Granit Xhaka, Hecor Bellerin, Kieran Gibbs, Laurent Koscielny, Lucas Perez, Mathieu Debuchy, Mesut Ozil, Mohamed Elneny, Nacho Monreal, Oliver Giroud, Per Mertesacker, Petr Cech and Santi Cazorla all look VERY life-like. However, Shkodran Mustafi and Theo Walcott look nothing like themselves. In fact, Walcott has been really messed up, bless him. 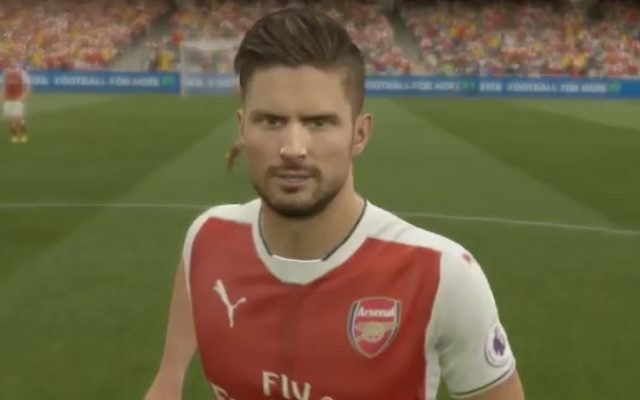 At least Giroud is gorgeous as ever.